As a little girl, you loved to drag your tattered white veil out of the dress-up box, run to your backyard sandbox and hold your daddy’s giant hand as he’d pretend to walk you down the aisle. He’d hum the wedding march and give you away to your biggest teddy bear. The guests were just the birds in the trees and your snoring boxer dog, but your imagination clung to the idea that you’d be married in the sand someday . . .
That someday is almost here. You met a man while vacationing with your family on Kauai last year. Sitting near each other on glorious Poipu Beach, you noticed you were reading books by the same author, and during the long chat that ensued, discovered that you were both into classic novels, big dogs and the original 70s TV series Hawaii 5-0. His lame attempt to “sing” the theme song (“Dun, dun, dun-dun, dun, dun. . .”) was so funny you agreed to go out for sushi with him the next day for lunch. Somewhere between the crunchy roll and the artfully sliced oranges, you had an inkling that this guy was a keeper — and not just because he’d read all of Hemingway. The two of you spent the next year trying to figure out how to go on a date, as he lived in Austin and you lived in Pasadena. You managed. And now that he has proposed and there’s a diamond on your finger catching the sunlight like a tiny tropical pool, there is no doubt in either of your minds that the only place to get married is on the same South Shore of Kauai that brought you together in the first place. You start hatching destination wedding ideas. The staff greets you with genuine friendliness and the moment you walk down the garden path toward the sweeping view of the pool, the waterfalls, and all the way to the ocean, you are madly in love with the resort. The twenty-five acres of the lush tropical landscape is so spectacular you can barely close your mouth. You check into your one-bedroom villa and are impressed by how spacious and luxurious it is. The floor-to-ceiling glass doors lead out to your sunny lanai, giving you an instant sense calm — coupled with a craving for a very cold mai tai and some throwback reggae. These are just the kind of comfortable accommodations you’d love to offer to your guests. You can already see your grandma whipping up breakfasts for everyone in her villa’s gourmet kitchen to save on restaurant costs. After a tour of the spa, the fitness room, the grand ballroom, and the poolside Holoholo Grill you text your mom that this may be one of best places to stay in Kauai ever — followed by a string of heart emojis. Taking your nuptials to Kauai is beyond exciting, exotic, romantic and all the great adjectives, but there are also plenty of logistics to consider — even with a professional planner coordinating at one of Kauai’s best destination wedding locations. For instance, you decide that holding your ceremony on the beach might not be the best choice for your guests. You have five beloved aunts flying in who are all elderly. You are sad to give up your sand dream, but you love the idea of exchanging your vows right here on the resort lawn encircled by coconut trees. You learn so much and see that by following some smart tips, you and your groom can throw an unforgettable wedding and get hitched without a hitch. Having a Kauai wedding expert on your team can make all the difference. An imported planner would not only be super pricey, but the learning curve would be steep. Kauai is a unique location, so a planner keenly aware of the ins and outs of the island is invaluable. They will have connections to local vendors and culture, nabbing for you top deals and service. Most of the Kauai resorts offer an onsite coordinator, so vet those, as well. These local saviors are your eyes and ears in absentia and can swoop in to handle any number of snafu’s that may arise in the weeks prior to your nuptials. Visit, visit, visit! The more time you can spend at your destination, at the hotel, getting to know the quirks, the back doors, the people and the insider details, the more smoothly your event will go. Another way to bring all your Hawaiian wedding ideas to fruition is to arrive as early as you can; a week before the ceremony is ideal. You will be on hand to make final decisions and even more vital, you will have ample time to ease into that groovy island vibe and relax, relax, relax. The beaches of Kauai are wild and varied and can change from season to season. That spot with the soft white sand and serene shoreline you fell in love with last summer may turn into a stormier, damper beach with deafening waves in the winter. You are asking your loved ones to travel to a faraway island. This is a huge request, impacting both time and money. Give your peeps as much advance notice as possible (8 months isn’t too soon!) to find good airfares, books their rooms, get work covered, schedule nannies, etc. Do not let your feelings be hurt if some of them simply cannot make it. Also, the sooner you get your dates on the calendar, the better the chances that all of the people you love most will be there to witness your big day. This may sound like a contradiction to number 4, and you may need a little extra help from the coordination gods, but be sure that the resort or hotel you’ve chosen has enough rooms available at that time to accommodate your guest list before you start printing invitations! Especially for top Hawaii resorts. Are your loved ones physically able to hop on planes and fly the tropics? 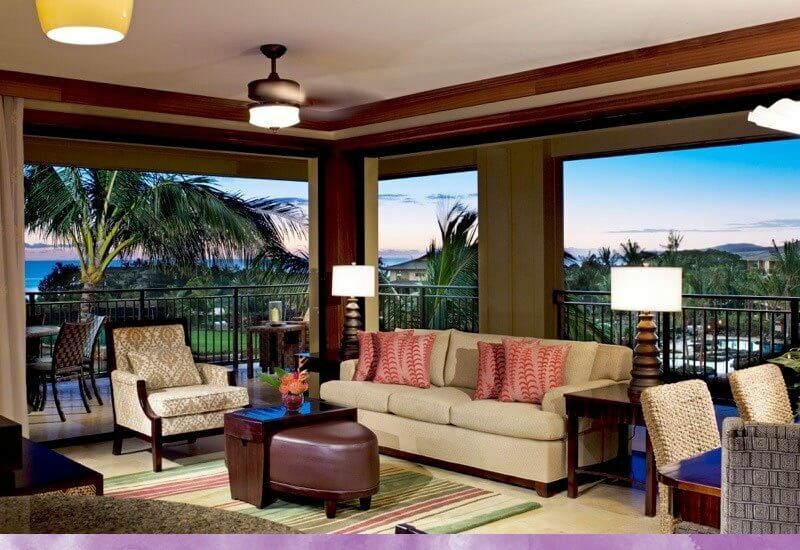 Do your friends and family have the kind of budget to travel to Kauai and stay in the resort you’ve chosen? Don’t give your loved ones the tough choice of either blowing the college fund or declining your invitation. You might consider building some financial assistance into your own overall budget to help offset the cost for those who may need help — especially anyone in the bridal party. Kauai may be one of the best places for a destination wedding — but only if your guests can actually get there. To put a finer point on number 6: When you ask your best friend or sister to be your maid of honor, let her know asap that you’ll be getting married in Kauai. This will give her the chance to consider if she can afford the time and the money to be everything you need her to be. Give her the opportunity to decline early on. The same is true for your bridesmaids. Be understanding if they simply are not able to pull it off; it is not necessarily an indication of how much they care for you! Click the following handy links for obtaining a wedding license in Hawaii and a Hawaiian civil union. 9. Lei it on you! When in Rome, do as the Romans, and when in Kauai — wear flowers! For centuries it’s been customary for brides and grooms to exchange leis as a symbol of their forever-togetherness. Kauai is one of the top wedding destinations, and as a guest on this ancient island, consider embracing this custom either for the ceremony or the reception. Plus, leis make you happy and smell divine. North Shore, South Shore, Coconut Coast . . . all of Kauai has tropical weather. A heavy, beaded ball gown wedding dress might not provide quite the same comfort or island vibe as something lighter weight, and you will certainly want to be aware that any dress you wear during a beach ceremony will have to contend with sand, wind, and water. Chiffon, tulle, silk organza, charmeuse, crepe, lightweight lace, and other breathable fabrics work best in island weather. White pleather? Not so much . . .
Of course, Kauai has lovely bridal shops, but can you imagine a last-minute dash to replace your missing dress? Checked baggage is simply too often late or lost. Like a comfort animal, keep your dress with you in the plane’s cabin. Plenty of services on the island (maybe even in your resort) can steam your lovely frock back into shape if needed. Possibly the most valuable tip on this list: Kauai is beloved not only for its spectacular natural beauty but also for its laid-back vibe. Clocks run a little slower here than in the big city, so give your caterers, florists and other providers a little leeway. If you are a control freak and like to stick to a strict timetable, it’s time to ease up, have another mai tai and trust the locals. Today is your wedding day. As the ceremony is about to begin, you squeeze your dad’s hand. This time it’s not a teddy bear waiting for you at the altar, but a man who makes you belly laugh pretty much every day and who wants to spend the rest of his life with you. Your father squeezes back. Your knees are a little weaker than usual as you step out into the sunshine. There, amidst the fluttering palm fronds, meandering streams and brilliant ocean beyond, sit so many loved ones who have traveled from afar to witness this. The scene is even better than you’d hoped. When you step up to the altar you realize that there is a lovely little low box of fresh sand there and the officiant gestures that you are both to stand in it. As you step into the sugary softness, you shoot a suspicious glance back at your dad who winks at you, and though your fiance shrugs, he is grinning from ear to ear. You feel loved. By the time you say your vows and kiss, and the officiant announces you as Mr and Mrs to the crowd, three ukulele players launch into a spirited version of the theme song from Hawaii 5-0. Your brand new husband looks at you, laughing — and now it’s your turn to wink. Interested in discussing your own destination wedding ideas? Please fill out our wedding contact form or dial our team directly at (808) 201.3805. For details on throwing the best destination wedding ever at Koloa Landing Resort, read our Koloa Landing blog and to meet Ikaika Parrow, our wedding coordinator extraordinaire, read his profile here.